Want to use keyboard accelerators to drive dialogues etc. in Mac OS X? Here’s how. Here’s an example: here I am quitting from Safari. As is often the case, the dialog has reminded me that I don’t actually want to quit as I have multiple tabs, so I want to cancel the operation. Pressing return will close Safari, but how do I select Cancel? 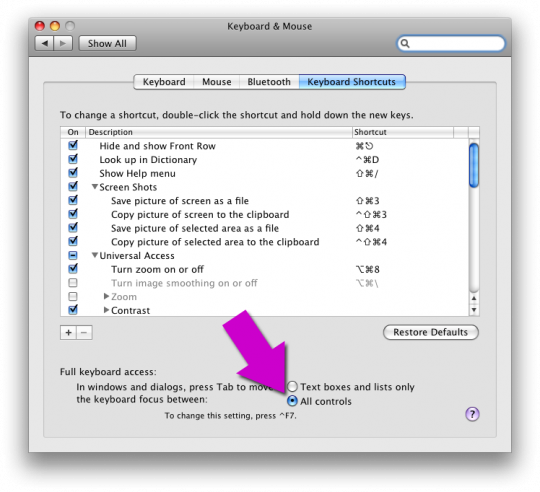 (Yes, I know you can press esc to cancel a dialog, but bear with me — the following solution works for all dialog selections and menus, not just Cancel). Or, much easier 🙂 , type ctrl+F7. Now when that dialog pops up it looks different. Notice that Cancel is surrounded by a blue glow — that’s the dialog option that currently has keyboard focus, and pressing the space bar will select it. Now you can navigate the dialog box using the keyboard: tab and shift-tab change the currently selected option, space selects that option, and return will always select the solid-blue default option. So in this example, space will cancel the dialog and return will do the default action (close Safari in this case).